Gökhan Güçlü, who was wearing the T-shirt, and 43 other defendants stood before Muğla Second Heavy Penal Court as a third trial over Erdoğan assassination plot began. 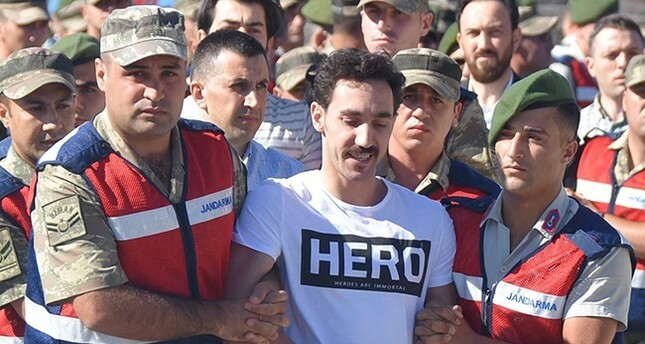 The "hero" logo and the fact that Güçlü was smiling while being escorted by gendarmerie officials to the court, sparked outrage, including inside the courtroom, where Mustafa Doğan İnal, one of the presidential lawyers, pointed the writing out to the judge. "The defendant describes himself as a hero apparently. He is no hero, he is someone challenging the rule of law," İnal told the judges. As a heated argument started inside the courtroom, the chief judge called for a five-minute break and to empty the room. However, the in-room tension continued after the break. The chief judge then ordered to remove Güçlü from the courtroom and called for a lunch break. İhlas News Agency (İHA) reported that the general directorate of the prisons launched an investigation into the T-shirt incident to find out whether the prison authority was negligent over Güçlü's controversial outfit. The directorate also ordered the examination of the clothing of all coup suspects across Turkey and instructed the removal of clothes with messages in English, İHA reported. The clothing choice of the defendants in other trials has also been a hotly debated issue, since the first major trials on the coup bid that killed 249 people started in February. Some defendants sparked outrage when they appeared before the courts with well-ironed suits and cool haircuts to match. Social media was awash with comments condemning the dapper looks of the officers, from a sergeant to a general who oversaw the mission to kill the president on behalf of the coup's masterminds. A Turkish daily had taken issue with the "good-looking" defendants and called on the authorities to issue "uniforms," preferably orange prisoner jumpsuits common in other countries for defendants in such high-profile cases. Unlike the United States and other countries, Turkey does not have jumpsuits or uniforms exclusive to prisoners or defendants and under a controversial interpretation of the law, judges sometimes reduce sentences in cases where the defendant dresses in a suit and observe "good manners toward judges" during the hearings. Two teams of pro-coup troops were dispatched to the Marmaris vacation resort where Erdoğan was staying in an attempt to kill him. Their mission failed when Erdoğan fled after being informed that a coup attempt was unfolding. The indictment against the soldiers says that Fetullah Gülen, the elusive FETÖ leader, had personally approved the plan to capture or assassinate Erdoğan during the putsch attempt, as he did for other coup plans. Gülen is also believed to have ordered the seizure of strategic locations from the presidential complex to the army's headquarters. Gülen is the prime suspect in the coup case and he faces life imprisonment. However, as in several other cases where he faces terror charges, Gülen has abstained from attending. He currently resides in Pennsylvania, and Turkey is seeking his extradition from the U.S.